Ok so let's get all the sadness out of the way and then get to business. First, I missed doing a summer book list last year, that should have been Year 5 (i think?) and that's sad. Also, this year's list is not terribly big. Also sad. And MOST SAD OF ALL - I will not have Very Illuminating Commentary from my husband Andrew on this year's list. That's super sad! But he wasn't home on the day I was making this list, and I'm not sure how much witty banter he can offer up on some cookbooks, you feel me? Quality over quantity this year, ma petites. That's what I'm selling, ha ha! 'The Lost Kitchen' by Erin French. Isn't that cover BEAUTIFUL?? I've been fascinated by Erin's story for awhile - you can read about her here. Her career as a chef began when she started creating secret suppers from her apartment. (I want to go to a secret supper!) Erin then began making pop-up dinners from within a kitchen in an Airstream, before finally finding a permanent home for her creative and seasonal menus in her hometown of Freedom, Maine. After being amazed at how she up and created, not just a restaurant per se, but an entire dining experience - I can't wait to check out her recipes, which include a Sweet Parsnip Cake. 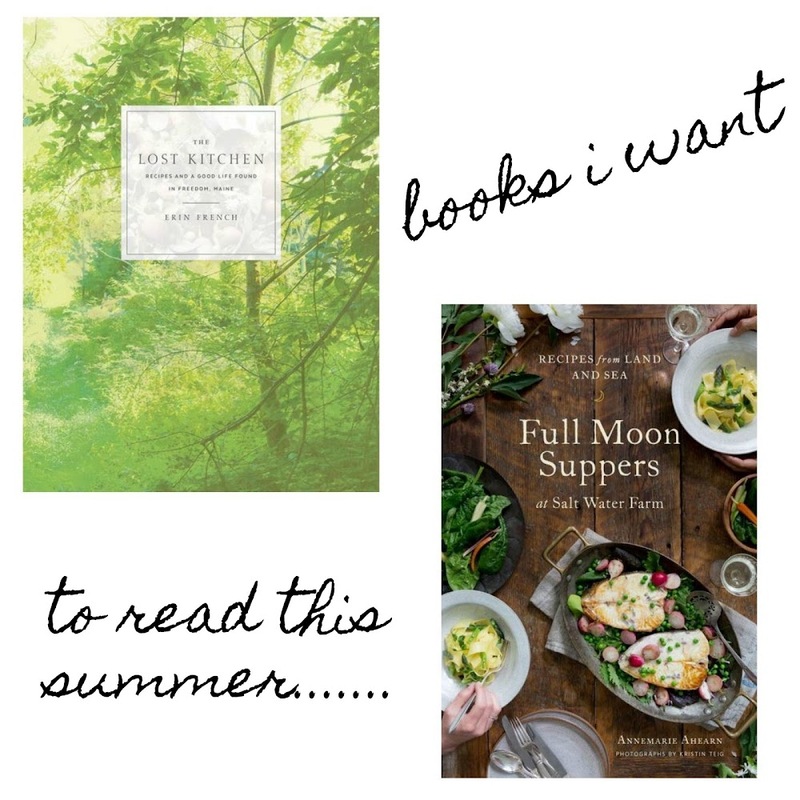 'Full Moon Suppers at Salt Water Farm - Recipes from Land and Sea' by Annemarie Ahearn had me at that title. Full Moon Suppers? First of all, I love the word "supper". Its homey and cozy status is something that the word "dinner" will never ever attain. And I love cookbooks that give you creative menus that make the most from each season. Twelve months, twelve meals, along with snapshots of each month's climate, its traditions, as well as things to do in the kitchen during each month and season of the year. This one sounds very cool and unusual and I would love to see it - just published this past May. I've got a little bit of a mixed bag thing going with these next picks. Something to take to the pool, beach, or backyard (or in my case - my car, as I wait for my kiddo at her various activities) - as well as something to sit and read in your coziest shorts while stuffing your face with brownies and a vat of iced tea, AND a little something to get later in the summer to place on your table LOOKING PRETTY. Actually, all of these would look pretty sitting around. 'Belgravia' by my beloved 'Downton Abbey' creator, Julian Fellowes. I'm so excited and I only have to wait a few more days until this is released on July 18. Amazon says that if you loved 'Downton Abbey' (how absurd to use the word "IF"), this tale of upstairs/downstairs life in an Edwardian home with "star crossed lovers and scandalous secrets" is for you. Apparently it traces a certain slice of society from the eve of the Battle of Waterloo to 25 years later when the newly wealthy Trenchard family seeks to move within the old money circles in the swanky neighborhood of Belgravia. I'm so there. 'The Moon in the Palace' by Weina Dai Randal is based on the life of Empress Wu - China's only female ruler - during the Tang dynasty. It details the origins of Mei (the future empress) - as she navigates her way through the imperial court starting from the age of 13 years old - moving from little girl to concubine, to chief consort, to emperor. The concubine political intrigue is laid out in intricate detail, and I'm really wanting to read this tale of how a highly intelligent and educated girl rose from the level of one of TEN THOUSAND imperial slaves to the highest position in China. 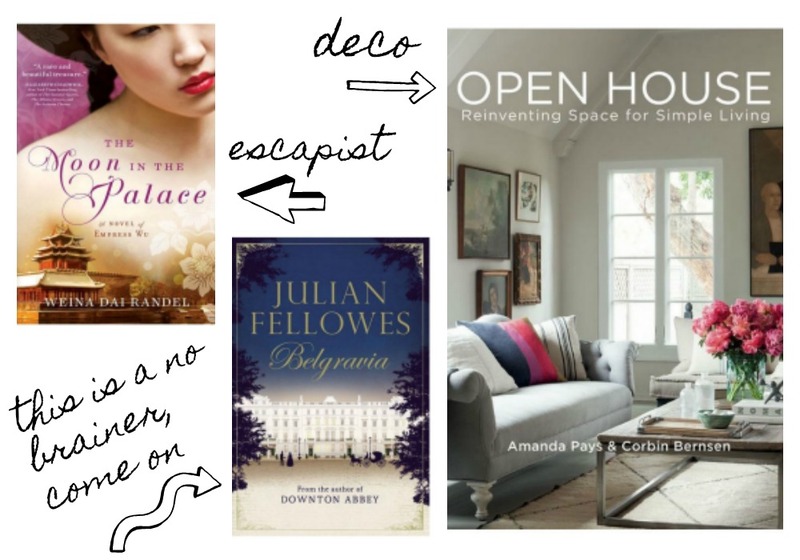 'Open House - Reinventing Space for Simple Living' by Amanda Pays and Corbin Bernsen. Moving on from ancient China palace schemes to decorating - actors-turned-designers Pays & Bernsen have been married for ages, and have also built a thriving home remodeling business together. After stumbling across some of their designs on Remodelista, I realized that I loved their brand of laid back home refurbishment, and wished I could see more of their work. And then I saw that they have a book coming out later this summer. I wish all my wishes could be so readily granted! I'm now going to wish very hard for a chocolate cake. And in case you're sitting there feeling shorted and cheated and you just need more books - here are previous summer reading book posts: this one. Also this one. Oh look! This one. BUT WAIT, there's more. This one. And if you are also feeling like you just can't WAIT for Autumn to arrive, here is a fall book post and also ANOTHER one. And one more. Knock yourself out!